Mixbook is the easy and fun way to make completely customizable photo books, cards, and calendars on the web – for free. With Mixbook, you aren’t limited to static pre-designed templates – our powerful design software gives you the freedom to lay out and design your creations to your heart’s content. We’ve dedicated ourselves to bringing you the best experience in creating photo products so that you can make keepsakes that truly reflect your vision. With Mixbook, you can truly Make It Yours™. Restrictions: Limit 1 unique $10 off coupon code issued per order. This offer is only valid on orders of $50 or more to one recipient address. Order must total $50 after discounts and before shipping and tax. Please allow up to 72 hours for $10 off coupon code to be issued. 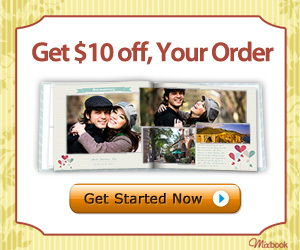 Offer expires 02/12/2012 (11:59 pm PST). Terms for $10 off coupon code:This offer is only valid with your unique code. This offer cannot be combined with other coupons, vouchers, Groupons, or applied after an order has been placed. Discount applies only to completed projects. No adjustments on previous purchases. Shipping and taxes will apply. One time use only. Offer expires 04/30/2012 (11:59 pm PST).